Growth in technology within the education sector has advanced rapidly. This movement has increased the learning capability of students and the techniques of educators. Ultimately the global workforce and society as a whole will benefit positively. As expectations grow and progressively fashionable methods and tools are touted, it is important to keep track of the anatomy of these advances in learning, so that they end up being used most efficiently. Dr. Ruben Puenedura has described the stages of technological advance in education as the SAMR model. 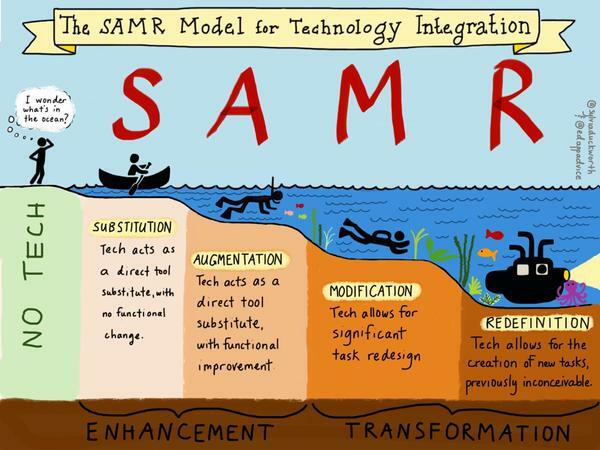 SAMR has become a widely adopted roadmap to the integration of technology into classroom settings. The model describes the first stage of EdTech in a classroom setting as Substitution, where technology acts as a direct replacement of older equipment. For example, lessons being written on computers instead of notebooks. While we are long beyond this stage in classrooms at the richer end of the education spectrum, many places are still progressing through this first stage. The second stage, Augmentation, is where the blossoming of learning opportunities begins to happen in earnest. Here, the substitution begins to bring about functional improvement in learning. Beyond the neat and tidy notes produced by a computer in the substitution phase, students may become able to share the notes over a network, or perhaps seamlessly integrate them with source material. In the Modification stage, tasks are fundamentally redesigned as the technology allows for improved lessons and a richer array of learning. At this stage, a student’s notes or assignment may well contain links to third party citations on the web, or embedded media relevant to the topic. Finally, the Redefinition stage enables entirely new lessons that were previously impossible and likely not even conceived. Instead of writing analysis of individual works of romantic era poetry in an English Literature class, students may write an algorithm that identifies stylistic similarities and differences between various poems from the era, develop models, and then compare them to stylistic models of the Neo-Classical or Victorian periods. It is in this final stage that entire disciplines are able to be viewed through new lenses and their very understanding is changed and expanded. Lingo Media’s EdTech products inhabit the Augmentation and Modification stages or the SAMR scale. We are proud to provide an integral part of the process by which learning English becomes easier and more accessible. Instead of repeating phrases back as a class while a teacher taps on a blackboard, ELL Technologies’ speech analysis and accent reduction via its Speak2Me and The Studio tools can provide individual feedback to students, decreasing the learning curve. Basic foundations of oral communication like diction and speaking will enable learners to gain the confidence necessary to practice their newly found language skills. Students are able to move on to more complicated lessons quicker. Ultimately, the exciting Redefinition stage of the scale is driven not only by technology but by the intellectual innovation of both students and teachers. As ELL’s products become an increased part of the middle two stages of the model, we’re looking forward to the products’ classroom use leading to their involvement in the future of English education.